Sit & Stand computer workstations are the latest innovation in the world of desk design, combining ergonomic form with considerable style. The ergonomic advice is clear – sitting down for long periods during your working day is simply not good for you. 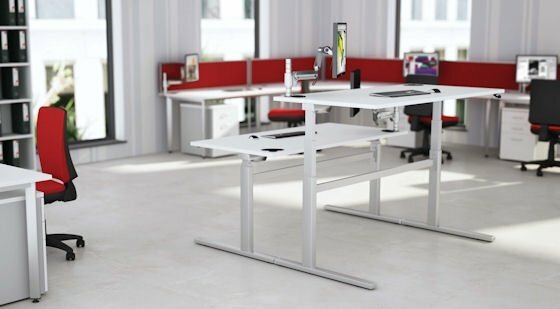 Sit & Stand desks are immensely comfortable and have been proven overall to be a healthier alternative to more conventional office furniture. Choose from a wide range of gas or electric adjustable Sit & Stand desks . To discuss your sit/stand (height adjustable) desk solution requirements or to request your onsite consultation please email: sales@Office-furniture-direct.co.uk or tel: 01480 220311.